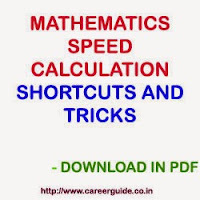 Here we have collected some important shortcut tricks and speed calculation methods to help candidates do calculation without using pen and paper and save their time in competitive examinations. These days cracking competitive examinations needs accuracy and speed. A good speed with accuracy can take you far ahead than other candidates and improve chances of success. So it is recommended to learn fast calculation tricks and shortcuts and save your precious time and crack any exam successfully.